A pair of French two-light table lamps by Maison Lucien Gau, Paris, 1970s. These high quality table lamps are of chased brass with opaline glass shades and Lucite fluted column. The satin finish glass shades under the brass top provides a very warm light! Maison Lucien Gau Paris has been creating and manufacturing lighting since 1860 and known for high quality lamps. Both lamps are fully functional and in very good condition, one lamp with oxidation signs to brass at the base edge. Number of lights: Each lamp with two E14 light bulb sockets. Height 17.75 inches (45 cm) Diameter 14.25 inches (36 cm). Skyscraper floor lamp in gilt metal gold lacquered and opaline sandblasted glass by Maison Lucien Gau. Famous manufacture like Maison Charles, Jansen, Bagues, Jean Perzel, Sciolari. 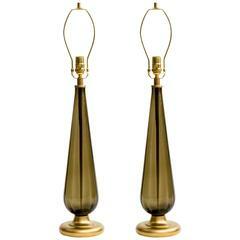 Pair of Italian smoke glass lamps with brass pedestal bases. Rewired with solid brass hardware. Murano, Italy, circa 1970s.